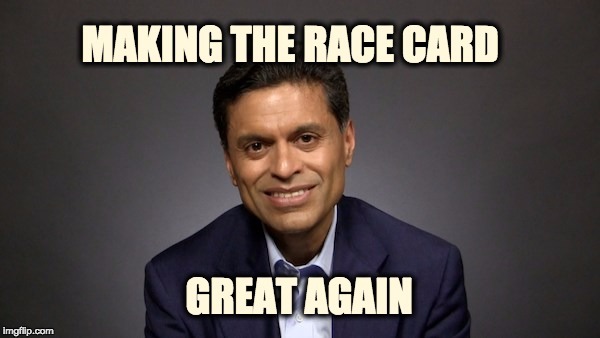 Chances are if CNN’s Fareed Zakaria wasn’t able to falsely accuse conservatives and Republicans as racists he would have nothing to say. His latest recrimination occurred Monday as he appeared on “New Day.” Having nothing real to add to the conversation, he belched out what passes at the network for “analysis” of the 2016 election. According to Zakaria those racist older white people ganged up and staged a “class rebellion” to elect Donald Trump because of Obama’s race. Of course, if the CNN blockhead bothered to compare his own networks exit polls for 2012 and 2016 he would have realized that Trump did slightly better among African-Americans and Hispanics than Romney four years prior. Is Zakaria implying that those older white men were African-Americans in disguise? Turnout among African-Americans was down from 2012. Maybe Zakaria meant that it was those older white men who forced Hillary to deliver a message that didn’t appeal to African-Americans as much as Obama did. Based on CNN’s track record they must have been of Russian descent. Zakaria appeared on New Day to promote an hour-long documentary that appeared on CNN later that day. After discussing Trump’s celebrity because of the Apprentice he started to disassemble the Trump voters as angry racists. ZAKARIA: (…) but then he also starts feeling the currents of America in very much an intuitive way — I don’t think he had any articulated sense — and he began to feel a few things. The anger — the anger against politicians. Remember, he runs on the Reform Party — he tries to run on the Reform Party ticket for a while and then he begins to see the toxic energy on the far right. Remember, his first political moves are birtherism. And he knew that the election of a black president had stirred a kind of ugly racial animus among some people — probably a small subset — but he knew a way to get directly to them. So all of it combined and it was a man who met his moment. At the point at which Donald Trump is elected is literally the low point in trust for politicians in Washington. It’s a 50-year low and that’s when Donald Trump, you know — so he got his timing right, which all great performers need. Zakaria is correct about voter anger against the establishment, so were the thousands of other pundits who pointed out the anger and long before Fareed got to it. That same anger against the establishment was part of the reason that Jeb Bush’s candidacy never took off. But if that anger was derived from the “toxic energy of the right” then why exactly did that same anger propel Socialist Bernie Sanders to mount an almost successful challenge for the Democratic Party nomination? ZAKARIA:I think the part of it that I was impressed by in doing the research for this is we know about the economics. We know about the hollowed out factories and the — and the coal mines. And what I was struck by was the other two factors. So that’s if you want capitalism. The other factor is culture. A real sense of cultural alienation that the older white, non-college educated Americans have the sense that their country is changing because of immigrants. Because maybe blacks are getting — rising up to a kind of central place in society. Because of, you know, gays being afforded equal rights. Because of, frankly, a lot of working women. You know, everybody is sort muscling in on the territory that if you think about it, the white working man had. And the final one is class — social class. We don’t talk about it a lot but the election of Donald Trump is really a kind of class rebellion against people like us. You know, educated professionals who live in cities who have, you know, cosmopolitan views about a lot of things. And I think there’s a whole part of America that is sick and tired of being told what to do by this, you know, over-educated, professional elite that Hillary Clinton, in many ways, perfectly represented, and that’s why they’re sticking with him. Oh, now I understand—-Trump voters were racist, misogynist, uneducated capitalist hicks from rural America who were sick and tired of blacks, women, immigrants, and gays taking their jobs. Fareed as a fellow educated professional, whose wife works (it’s called community property) and has never had issues with the African-Americans or the gay people who have worked for me, allow me to explain that it is impossible to have a class rebellion against people like you because the way you stereotype people is proof that you have no class. I would add that another thing that helped Trump win is something that you and your CNN compatriots would never discuss. Obama’s attempt to make Americans of faith pay for abortion services drove Catholics and Evangelicals away from Clinton and toward Trump. BERMAN: But what shakes that, if anything, Fareed? Does it have to be a different view of what America has become to them or a sense that President Donald Trump has failed to deliver on the things that they were expecting him to deliver on? ZAKARIA: It’s a great question. I — you know, the research shows that people don’t vote so much on policy issues. I mean, there are — there are studies that show at the end of an election you ask people what party stood for what policies and about more than a third get it wrong. They think the Democrats are for repealing the ACA and the Republicans are in favor. You know, it’s — what they vote for is does this guy get me? Does this person know me? Is he the kind of person — we have David Brooks on the program saying what they ask themselves is this party full of people who look like me? Who are like the people I hung out with in high school and that’s almost like a tribal team loyalty. So I don’t think that — I don’t have a good answer for what will shake it. I think what could change it is if you found a Democratic — now, if the Democrats are all sitting there worrying about what exact economic policy they should have and should they be more, you know, left-wing –I think the key is can you connect, you know. Bill Clinton had very, you know, kind of centrist policies but he connected. A white, working-class voter looked at him and said this guy gets me. And unfortunately, they didn’t feel that way about Hillary Clinton. If Americans didn’t care about issues in 2016 how does Fareed Zakaria explain this, very little of Clinton’s ads focused on policy? 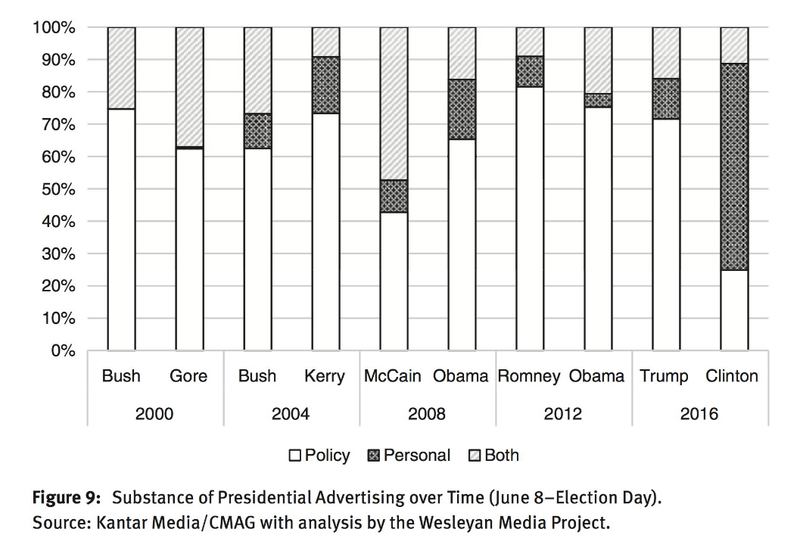 When they compared the last four presidential campaigns (eight candidates) Clinton’s advertising ranked dead last in terms of presenting policy positions. About a quarter of her ads were purely about her positions on issues. Generally, Clinton’s ads focused on identity politics rather than trying to appeal to the broad electorate, and/or instead of presenting her stance on issues her ads attacked Trump. But this was an election where the American people wanted solutions, Hillary didn’t present solutions. No Zakaria is very wrong, people didn’t vote for Trump because the Republicans looked like them, it’s because Trump thought like them. He appealed to an America who objected to the economic stagnation that continued despite the fact that the recession ended eight years before. He appealed to an America whose health insurance costs and deductibles increased at an accelerated rate thanks to Obamacare. He appealed to Americans who were tired of a Supreme Court that legislated from the bench and a President who ignored the constitutionally mandated separation of powers by “ruling” via executive fiat. It’s well past time for Fareed Zakaria and his liberal compatriots to wake up and smell the defeat! Despite the arrogant way liberals look at Trump voters, they are not a bunch of ignorant rubes. Trump voters cared about policy, something that Clinton did not offer. It wasn’t that Republicans looked like them, it was that Hillary Clinton didn’t address try to address their concerns. Yes, they were angry at years of empty promises from the beltway, but it wasn’t only Caucasians Americans who were angry, it was also Democrats who “felt the Bern,” as well as some Hispanic and Black Americans. But Zakaria would never admit those facts because using facts takes time, effort, and an intelligence he rarely tries to tap. Below is a video of the Zakaria segment.